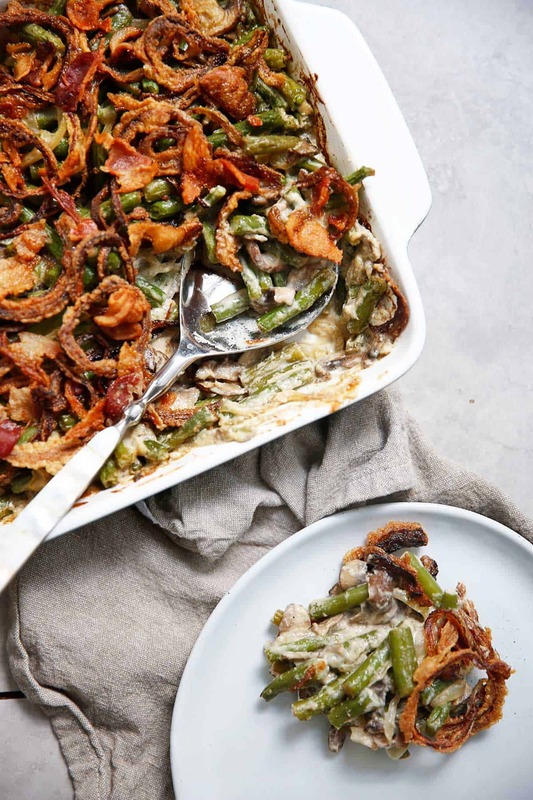 This lightened up, healthier version of a Green Bean Casserole is sure to be a crowd pleaser this holiday season! It’s dairy-free, made without any soup mix, and EASY to make. It’s a fabulous and hearty holiday side dish topped with the most perfect crispy fried onions! 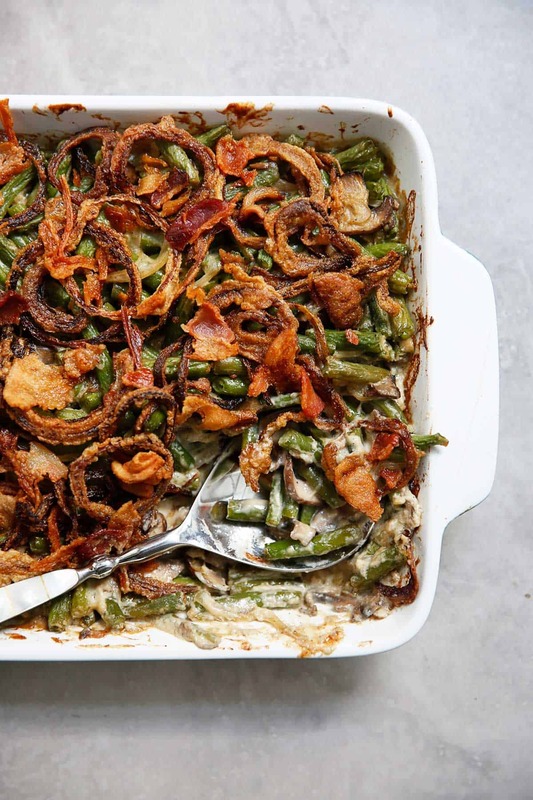 I didn’t grow up with a green bean casserole during the holidays and now that I’ve had it (and a version that is cleaned up), I will absolutely be making it year after year! Creamy, without any of the cream! Flavorful with aromatic veggies and herbs. Tender, cooked just right green beans in bite-size pieces. How do you make french fried onions healthier? Pre-heat the oven to 350 °F. Grease a 9 x 9 inch baking dish with butter and set aside. In a small skillet, heat avocado oil until hot. While waiting for the oil to heat up, whisk the egg and arrowroot together in a medium mixing bowl. Working in batches, dip the onion into the egg/arrowroot mixture and then place into the hot oil. Cook for about 2-3 minutes on each side, or until a dark brown. Set aside on a plate lined with paper towels. Bring a gallon of water and 2 tablespoons of salt to a boil in an 8-quart saucepan. Add the green beans and blanch for 5 minutes. Drain in a colander and immediately plunge the beans into a large bowl of ice water to stop the cooking. Drain and set aside. *See notes for recipe steps if you would rather roast the green beans. Melt the butter in a 12-inch cast iron skillet set over medium-high heat. Add the mushrooms, 1 teaspoon salt and pepper and cook, stirring occasionally, until the mushrooms begin to give up some of their liquid, approximately 4 to 5 minutes. Add the onion, garlic and coconut aminos and continue to cook for another 1 to 2 minutes. Add the cashew cream and mix well. Add the broth and simmer for 1 minute. Decrease the heat to medium-low and add salt, pepper, onion powder, and garlic powder. Cook over low heat until the mixture thickens, stirring occasionally, approximately 6 to 8 minutes. Season green beans with salt and pepper. Add green beans to skillet with the sauce and mix until the green beans are well covered. Taste and adjust seasoning as needed. *do not salt the green beans if you roasted them. Pour the green beans and sauce into the 9 x 9 baking dish. Bake for 30 minutes. Remove from the oven and top with crispy shallot and bacon. Bake for an addition 15-20 minutes, or until green beans are tender and bubbly. Can’t wait to hear how you like! 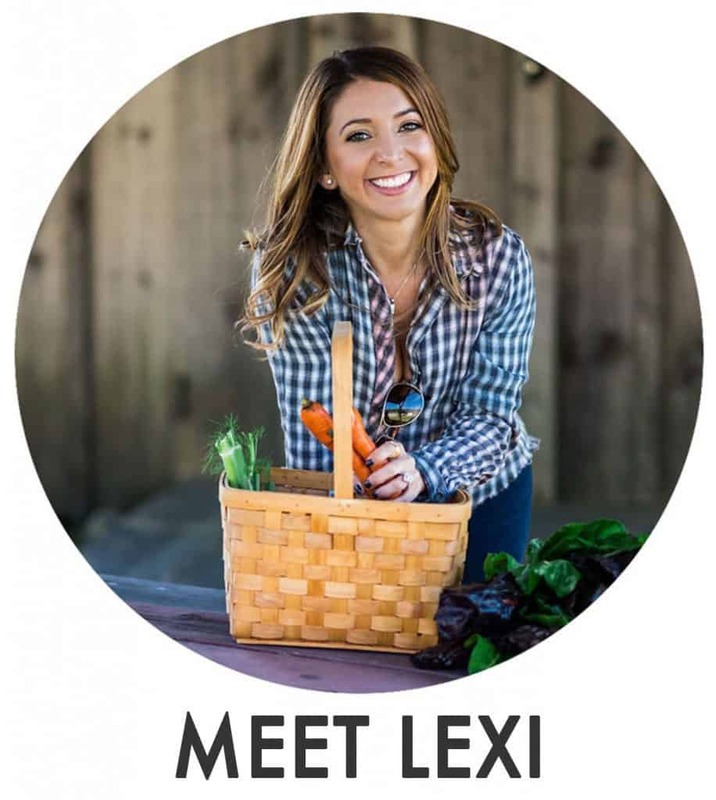 Awesome Lexi! Il can’t believe this is dairy-free! I didn’t grow up with green bean casserole, either. And I’ve had a hard time getting behind the traditional versions with all the soup mix, etc. But I’m TOTALLY down for this lightened up dish! I need to try it ASAP! Also, I just want to pick off all those crispy onions! 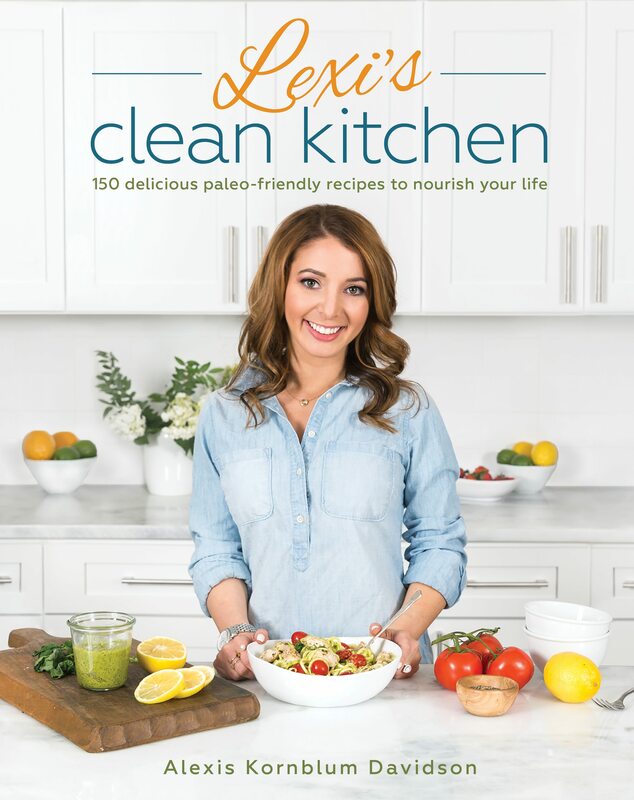 Coming to a dinner table near me…ASAP! Perfect side for turkey day! One of my favourite blogs! Thanks you! Am I reading the instructions correctly?— use one onion to make the crispy topping and another onion gets cooked into the sauce? So excited to make this! Do you think I can prepare everything other than the Green Beans tonight (night before) and then in the am roast the green beans and mix with the sauce before cooking? Thank you!! This looks amazing! Can’t wait to make it. Is it possible to use GF flour instead of arrowroot? That, or tapioca will probably work! This looks amazing!! One question when you go to make the cashew cream..do the cashews have to be raw or roasted? This looks great. But it says to mix onions with garlic and coconut aminos. Then later it says to top with crispy shallots. I don’t see shallots listed in ingredients. Are onions used twice? Is there an easier replacement for Cashew Cream? Can’t wait to try it! We’re having a Lexi’s Clean Kitchen Thanksgiving! YAY. You probably can, but this is the way we’ve made this dish and haven’t tested it other ways! Can you use roasted cashews instead of raw ones for the sauce? If they’re salted just be careful not to add too much additional salt. 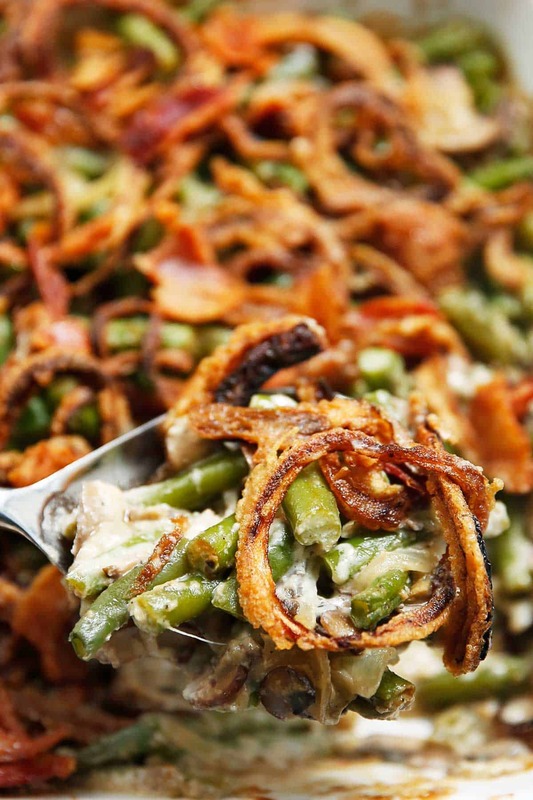 I was raised with some sort of green bean casserole so it’s a must at my Thanksgiving table! I just wanted to say that I tried this recipe last week to give it a test run, and let me tell you, this recipe is AWESOME!!! Everyone at my table raved over it and wanted seconds and thirds. And the recipe! 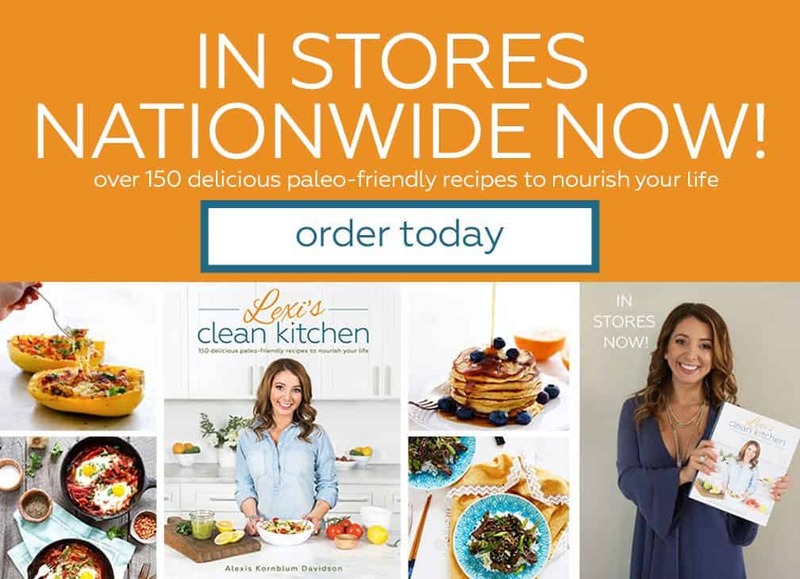 Lexi, thank you for such delicious recipes to make our Paleo journey that much better!!! You’re one of my all time favorites!!!! !